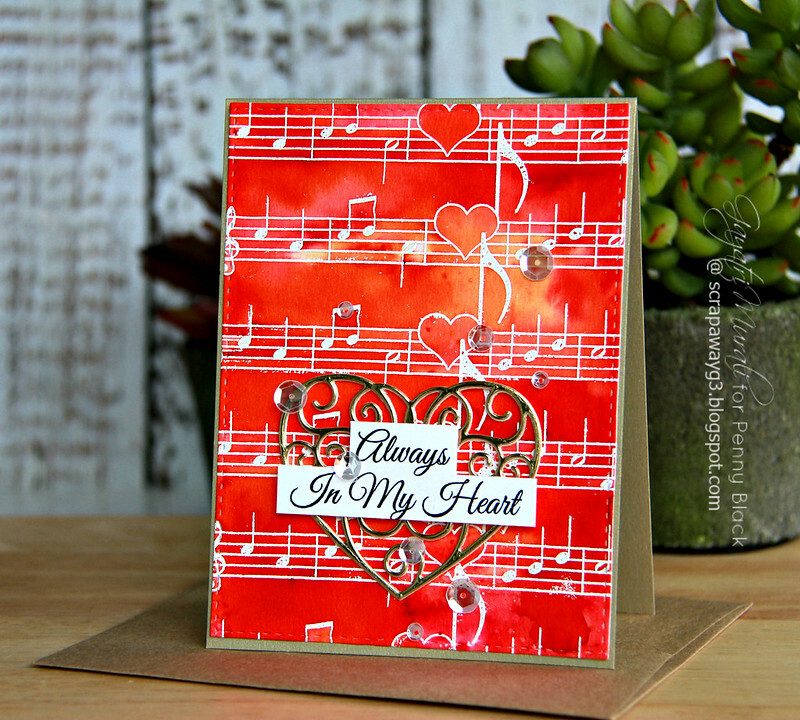 Penny Black new release card – Always in my Heart! I cleaned up my craft room this morning. Took the whole morning with couple of helping hands to clean out my room. Lots of stuff needs new home now. I will be putting on a for sale page here over the weekend. So keep a look out. The clean room was inviting to craft, I made a card. With Valentine’s day fast approaching, Penny Black has released some gorgeous new stamp set and dies. They are all available for purchase at Penny Black store. Today’s card is using Penny Black’s new release stamp set called Happy Hearts and new die called Fancy Heart. I love the details on the Fancy Heart die and the all the different border images on the Happy Hearts stamp set. This is my card. I white heat embossed the music border die on watercoloured paper. Then used Ken Oliver’s Colorburst Orange and Alizarin Crimson colour to colour the entire background. This is my first time using Colorburst pigments. Although I have seen them used on videos, I was very cautious using it myself. So I sprayed the watercolour paper with water then added the pigment. The colours were not mixing with water initially, so sprayed more water, then I started using brush to aid it. I think Alizarin Crimson took over and most of my Orange colour got lost. I still love how the colours blended in certain places. I will be getting more of these pigments and using them. Although I am a control freak lol!, I still like unpredictable the results are using Colorburst. 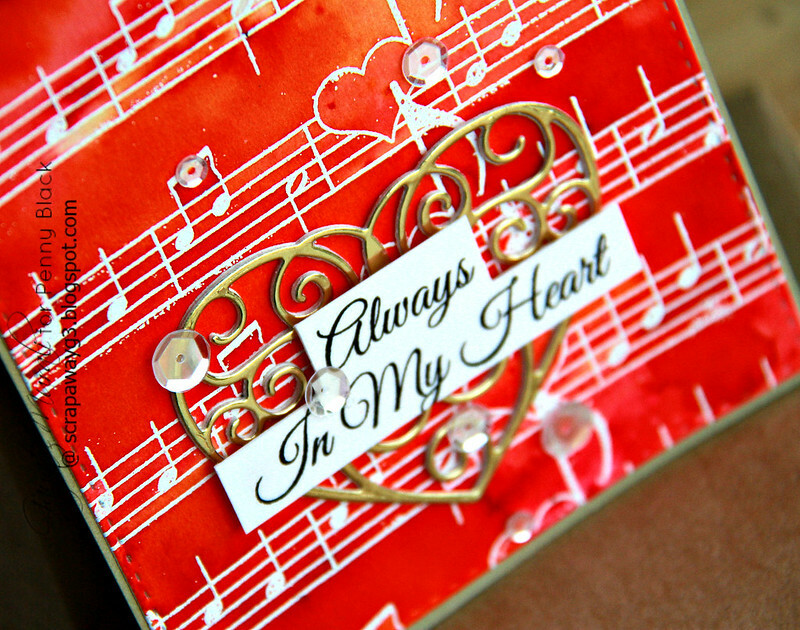 For the focal point, I die cut the Fancy Heart twice in white and once in gold foiled cardstock. Then stacked glued them for dimension. I adhered this towards the bottom centre of the panel. The sentiment is from Happy Hearts stamp set which I stamped on white cardstock, trimmed and adhered using foam adhesive. Finally embellished with Pretty Pink Posh Sparkly Clear sequins. The panel is adhered to a brushed gold card base. 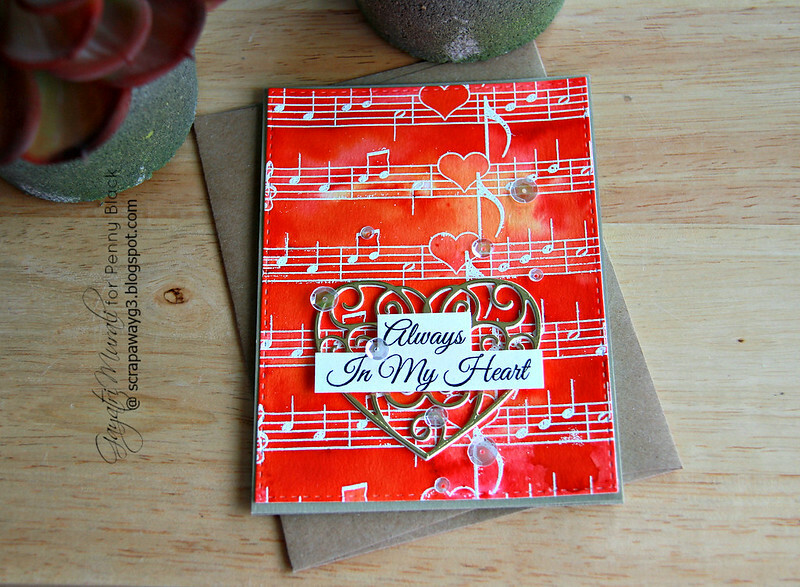 I love the gorgeous red and orange background with gold detailed heart. Hope you like my card. Such a lovely card Gayatri!! A beautiful card, love the vibrant colours of the background too. Such a pretty card. I love the Happy Hearts stamp set. Thanks for your beautiful card featuring it.